It is such an honor to have Miyoko Sakatani as a cast member in The Song of the Nightingale. Her spirit and determination are a force to be reckoned with, and as I've now watched the show several times, she certainly grabs the audience's attention when she performs! Below, she shares her performance background and then some. MIN: Please tell me how you got into performing. MIYOKO: In 2008, after a 40 year career as a critical care nurse and health educator, I heard about the Stagebridge Theatre Company in Oakland. Within months of enrolling in a singing class, I auditioned for their musical comedy troupe Never Too Late, and got cast. I never seriously considered pursuing anything theatrical, so this was quite a surprise to me and my family. But now, I guess you could say I've entered into my “second act” career! Over the last 5 years at Stagebridge, I have had the great opportunity to be cast in several of their premiere musical productions. But the shows that I am most proud of are the multicultural, inter-generational musicals offered annually to the Oakland Unified School District. The one that was most significant for me was “Grandfather's Journey,” based on Allen Say's wonderful children's book recounting his own personal story about his Japanese immigrant parents, their cultural and family struggles and their experience during WWII. A story very near and dear to my heart with my own family history. I was thrilled to dress in a traditional kimono and honored that “Grandfather,” wore a kimono that belonged to my father. I also incorporated a beautiful kimono that my mother wore as a child. It was a very emotional experience for me. But, despite all this good fortune over the last 5 years, I must say that the most fulfilling part of what I do is performing regularly for the elderly in Bay Area senior care facilities with Never Too Late and with a little ukulele band I belong to. So much love and appreciation given and received. MIN: Are you still working right now? Tell me some more about your work in medicine. MIYOKO: Since leaving the hospital, I continue to work as an independent nurse consultant. But my real passion is and always has been in integrative medicine. While continuing my work in critical care, I began to pursue a degree in naturopathy in 1985. I shifted from teaching critical care nursing, to offering workshops on holistic health with my husband Richard, who is also an RN. I realized early on how vital it was to bring these healing practices into the hospital and apply them at the bedside. Richard currently works at SF General Hospital and gives Reiki treatments and massage to his patients with phenomenal results. MIN: What drew you to audition for The Song of the Nightingale? MIN: What are some mottos you live by? MIYOKO: I would say my Buddhist roots run deep within me, so I try to bring peace and understanding into every situation. I also try to live by the practices of the Four Agreements (don Miguel Ruiz). MIN: Anything else you'd like to add? MIYOKO: I'm feeling I'm a part of something so rare and beautiful and inspirational with The Song of the Nightingale, and incidentally, I am feeling the same about my mother just turning 100 years old. She is one of the last of Issei (first) generation surviving a lifetime of hardships and I am humbled and so deeply grateful. Miyoko Sakatani (left) with fellow cast members from L to R: Isabel Anne To, Ted Bigornia, Chris Juan, Lindsay Hirata, Ji-Yun Kim and Deedra Wong. 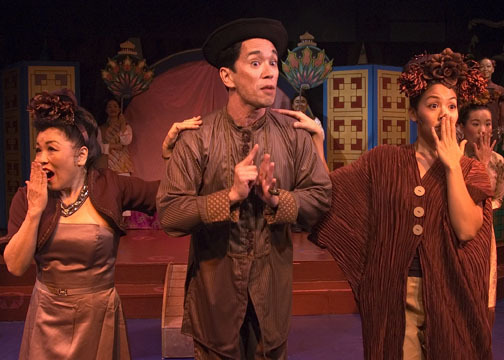 Posted on October 21, 2013 by Min Kahng and filed under Performing Arts, Musical Theater, Nightingale and tagged interview Miyoko Sakatani stagebridge The Song of the Nightingale.